A motorist stops to examine a pot-hole which her car ran 'into' in Horncastle . A major re-structuring of Lincolnshire County Council’s Highways department will make it easier to track complaints - including requests for pot-hole repairs. That’s the claim made by Horncastle’s county councillor Bill Aron, who also says the town will have a dedicated officer to deal with highways issues. 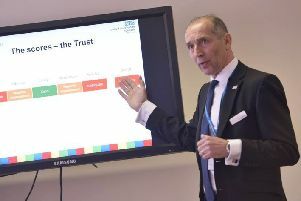 Speaking at last Tuesday’s annual town meeting, Coun Aron said ‘budget restraints’ had made it difficult for all departments at the county council as the authority faces the on-going challenge of saving money while maintaining services. He explained the ‘major restructuring’ of Highways had been completed with what he termed a ‘few modifications’ after requests by councillors. He said the changes would be rolled out across the county and would feature a Highways’ officer staging an ‘annual walkabout’ with local councillors to discuss any issues. Highways will also hold quarterly meetings with town and parish councils. Coun Aron added any correspondence about issues in specific communities would be sent to the relevant county councillor while town and parish councils will be handed leaflets with up-to-date contact details for all officers. Questioned by town councillor Matthew Wilkinson, Coun Aron accepted there had been problems with the previous system which had led to claims complaints were not always followed up. Coun Aron pledged to forward any complaints he received but admitted it was ‘beyond my remit’ to ensure every pot-hole in the town was repaired. Coun Aron said pressure from backbenchers at County Hall had led to the reorganisation and he assured town councillors the new system would be a lot better. Coun Aron faced questions about on-going issues in several areas, including West Street, while town council chairman Brian Burbidge said he was ‘sceptical’ the changes would work but added ‘anything would be an improvement’. elections. I must again thank all those who voted for me. Increased majority. * A leaflet with all the contact details will be available to Parish Councils.